Mount Columbia is the second-highest peak in the Canadian Rockies, and the highest of 11 11,000-foot peaks that ring the Columbia Icefield. 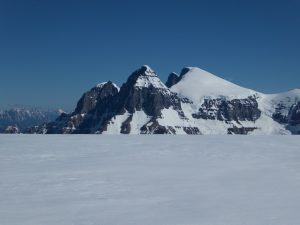 Unlike Mount Robson, whose 10,000-foot south face is visible from the highway, Columbia is a shy mountain, seen only from parts of the Icefield and its surrounding peaks. Therefore most people never see it. 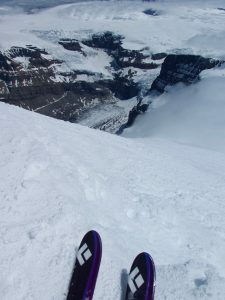 The standard route climbs the Athabasca Glacier to the southeast side of the Icefield, then makes a mostly-flat traverse to Columbia at its far west side. Depending upon the exact route chosen, it is about 25-26 miles round-trip. I had been hanging around the Glacier Discovery Center enough that people were starting to recognize me — never a good thing — but the weather and my cough finally both cooperated, so I could finally tag my peak and leave. The result was painful, as I am not used to long ski tours, but ranks among my favorite days in the mountains. In addition to some incredible and unique scenery, this outing and my other two trips up to the Icefield helped dispel my irrational fear of the Athabasca Glacier approach and the Icefield itself. It’s serious terrain, but as is often the case, it can be managed with caution and mountain sense instead of gear and partners. I had a quiet night in the Sunwapta Lake parking area until a few minutes before my 4:15 alarm, when two trucks pulled in to either side of me. 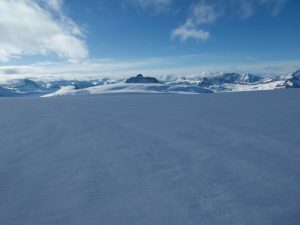 They proved to contain two parties headed across the Icefield, a pair headed for the Twins, and a group of four headed for I-don’t-know-where. I consumed my cup of sadness and started just after the first group, shortly before 5:00, catching them as they put on their skis at the toe of the glacier. Figuring that I wouldn’t be carrying my skis much, I took my new daypack, which has enough room for gear plus stash pockets for food. I slightly gapped the pair headed for the Twins on the way up the familiar Athabasca Glacier, topping out in around two hours. 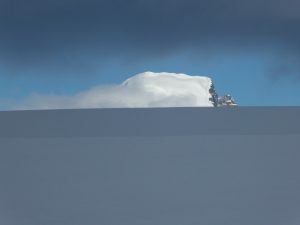 They had been making good time, but disappeared somewhere in the middle, perhaps taking the long detour left instead of going under Snow Dome’s seracs. I, of course, took my chances on the direct route, and saw no ice fall in the hour or so that I could see the seracs. Judging by the debris, I might get hit if something big came loose, but it would bounce and roll first, cutting its momentum and giving me a chance to dodge. Plus, the detour looks way sketchier, as it parallels a number of crevasse fields. The light clouds were breaking up, and I finally got direct sun a bit after 8:00, stopping to put on my hat and sunscreen. With no fog obscuring my view, navigation was simple: head more or less straight on from the top of the glacier, then turn slightly right as you see Castleguard. When Columbia starts emerging, aim at or a bit left of its summit to hit the highpoint of the trench. This part can be a grind, skinning across slightly-undulating, nearly-flat terrain with only distant landmarks. Getting around Snow Dome takes forever. 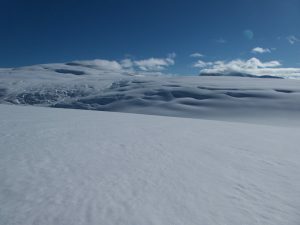 However, the views of Bryce, Castleguard, and the Icefield lit by the sun breaking through patchy clouds kept my mind occupied, and the snow was in near-perfect condition. I actually overshot the highpoint of the Trench a bit, and had to backtrack slightly before switching to ski mode to dive in. I tried to gather some momentum, but ground to a stop before making any progress up the other side. From there, it was an interminable skin up the nearly-flat ice peninsula leading to Columbia’s base. The scale of the place makes itself felt on this stretch: the summit pyramid looks small, but is actually almost 2000 feet high, while the almost-flat approach above the Trench is nearly three miles long. Columbia’s east face had been baking all morning, so despite the cooler night, it was starting to become posthole country. Fortunately, it looked like a couple groups had summited in the last few days, and their boot-packs were still relatively firm. Unfortunately, they seem to have been very tall, because the steps were placed awkwardly far apart. Based on a trip report I had read, I had anticipated stashing my skis and booting both up and down. However, I saw ski tracks on the face, and it is both broad and not too steep (about 45 degrees), so I decided that it should be skied. To my delight, I found that my new daypack can carry skis cross-wise using some external straps, though I doubt that is their intended purpose. Lacking a serious waist-belt, the pack is not super-comfortable while carrying heavy skis, but… good enough. Unfortunately, I basically imploded on the 1500-foot boot-pack to the top. This being May, I had packed fewer calories than the math suggested, so perhaps rationing contributed. More likely, I was just worn out after doing more skiing than I have done in years, perhaps decades. I made my pathetic way up the face, cheered by the view of the Twins to my right, and the prospect of skiing down this thing. 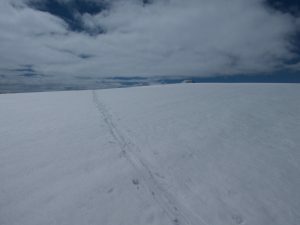 Following the herd’s tracks left of a 30-foot summit cornice, I sketched across a bit of shallow snow over ice, then popped through the short part of the cornice to emerge on the summit plateau. I could not have asked for better conditions: it was calm, clear in all directions, and probably right around freezing. I spread my windbreaker on the snow, rooted around my unused crampons to dig out my down parka, and sat down to admire the views. 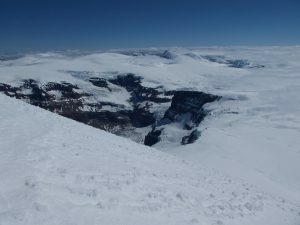 Far to the east, I could make out the head of the Athabasca Glacier in the distance, between Andromeda and Snow Dome. Next door to the north rose the South Twin, presenting its fearsome 6000-foot south face. Directly to the east, the Columbia Glacier falls in double ice-falls from the Trench to the headwaters of the Athabasca River. Unknown mountains stretched to the horizon in all directions: the Rockies to the north, south, and east, and the Selkirks barely poking above the cloud deck to the west. After a sandwich and a brief summit nap, I switched to ski mode, then pitched over the edge onto the east face. My quads were tired from the climb, and the snow was heavy, so I had to stop every dozen turns to recover. Still, going down made up for the horrid slog on the way up. The snow was starting to soften, and the flatness of the plateau back to the Trench made itself felt. Though it was not worth switching to skins, I was forced to do some exhausting skating to get through one stretch. Things improved once the plateau started dropping to the Trench, and after a screw-up where I drifted too far left and ended up on the edge of a huge crevasse, I righted myself, and managed to hit 43 MPH in a tuck down the final slope. Now it was time for the slog. I ate my last granola bar, then began skinning up the other side. I followed an old track for awhile, then switched to navigating by landmark, aiming for the left-hand skyline of an unnamed peak southwest of the Athabasca Glacier. 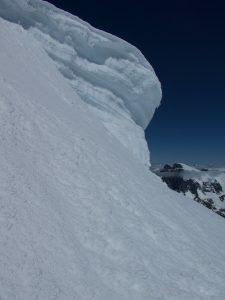 This long traverse is a trade-off between elevation gain on the direct line nearer Snow Dome, and distance on a slightly longer and lower route farther south. The snow was starting to soften, and I was out of water; the day was becoming distinctly less fun. At last, I reached a point where I could switch to ski mode for the rest of the way home. After a fast, easy descent to the head of the glacier, I took the current line skier’s left of its head, which is now a crevassed disaster, then linked turns down the headwall. The snow was getting sticky, so I couldn’t match the previous outing’s speed, but I still made good time all the way to the lower, flat part of the glacier. Unfortunately it was mid-afternoon, and the snow had been baked to a wretched, sticky state; even following the morning’s skin track, I had to constantly double-pole to keep moving. The final stretch was even slower, as I stumbled across the moraine with my skis over my shoulder, crossed the rope barrier right next to the “you will fall in a crevasse and die” sign, then clomped through the tourist hordes to reach my car. Despite the slow finish, I was surprised to make it to the car faster than I had expected — just under 11 hours. As I have established before, I am usually 10-20% off what an elite athlete can do, even at things I should be good at like uphill running. I was therefore very satisfied to be less than 20% off the 9h18 FKT for Columbia, set by members of the Canadian national ski mountaineering team. Ill-timed illness has kept me from doing as much skiing as I had hoped while in the Great White North, but what I have done has been high quality. Hopefully we’ll have a decent winter wherever I end up in the States next winter. This entry was posted in Canada, Skiing, Type II fun. Bookmark the permalink. Do you use two different boots? One for skiing and one for climbing? Roughly what percent of trip was skiing and what percent was climbing? Do your feet get very wet and cold on this type of trip? I spent less than an hour not on snow/glacier, and only 1-1.5 hours booting up a snow slope, so it was ski boots all the way. 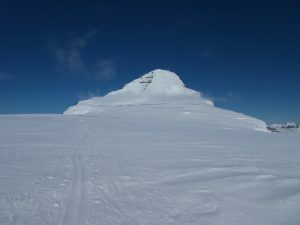 All of the Icefield peaks can be done almost entirely on snow. Ski boots are basically plastic mountaineering boots, so they’re very warm; my feet were wet, but it was all sweat. If I had to do any nontrivial rock scrambling or hiking, I would carry either trail runners or mountaineering boots, since my ski boots are pretty clumsy. Very impressive Sean! I’m sure most elite athletes don’t have the necessary skills and drive to do what you are accomplishing out there. Someone sponsor this guy already!!! Haha, I wish… Neither the AAC nor the few companies I contacted seemed interested this year. I’m pretty sure you could day-trip Columbia if you had the drive to wreck yourself. 16 hours of daylight is a lot of time to cover 40 k.